The meaning of Guardianship in Marriage, its Limits and Shari'ah Regulation. This book deals with an important social issue. Generally a daughter is not consulted before her marriage is finalized. Her likes and dislikes are not given weigh and often her guardian overrules her wishes. He marries her off without her permission. 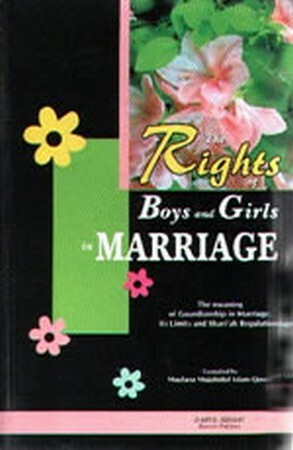 This Book discusses the issue and tells us also who is eligible to be her guardian (for marriage) and what are his rights. Can an adult intelligent girl decide independently on her marriage? What is the postion when young children whose guardian gets them married attain adulthood? Can they revoke his decision? The book is written by Mawlana Muhahidul Islam Qasmi and approved by great scholars like Mawlana Abdul Hassan Ali Nadwi, Muhammad Rafi Uthmani and Muhmmad Taqi Uthmani. The English translation is now available for our readers filling in the gap of a book on this subject.